The key here is the gains generated by owning US-denominated assets as the USD appreciates. Is the Greatest Bull Market Ever finally ending? One straightforward approach to is to follow the money, i.e. 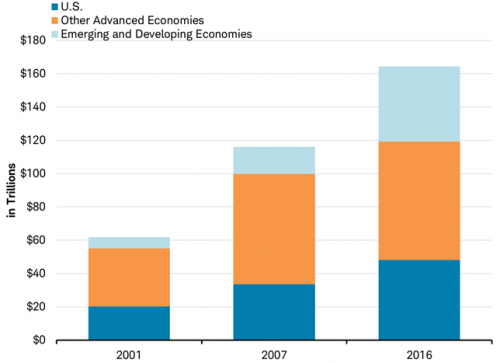 global capital flows: assets that attract positive global capital flows will continue rising if demand for the assets exceeds supply, and assets that are being liquidated as capital flees the asset class (i.e. negative capital flows) will decline in price. Global capital flows are difficult to track for a number of reasons. A significant percentage of global mobile capital is held in secretive offshore tax havens and "shadow banking," and tracking global corporate capital flows is not easy. Capital held in precious metals may not be reported, and assets such as enterprises and collectible art may be grossly undervalued for tax purposes. Toss in shadow holding companies, LLCs with obscure trails of ownership, etc. and a definitive account of global capital flows is ultimately a guesstimate. Despite the limitations of tracking global wealth, Credit Suisse Research Institute's (CSRI) issued Global Wealth Report 2017 gives us some clues about where capital is flowing in and where it's leaving for safer, higher-yield climes. Foreign exchange matters. Say a money manager moves $1 billion out of U.S. Treasuries (denominated in the US dollar, USD) into bonds paying a hefty 15% in annual yield denominated in an emerging market currency. If that currency loses 20% of its value vis a vis the USD annually, the capital loses 5% of its value / purchasing power despite the hefty yield. 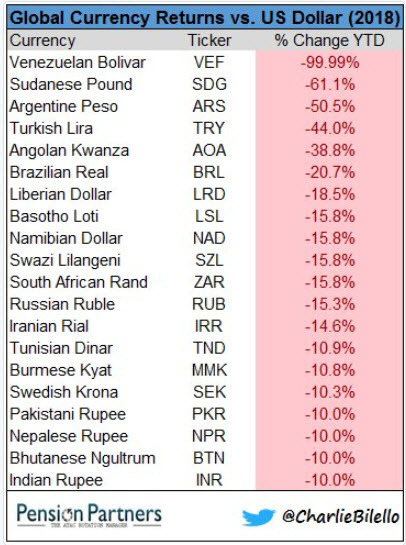 The trick is to arbitrage yields and currencies so borrow in cheap currencies that are declining and buy higher-yielding assets denominated in currencies that are rising in value. For example, if a manager moved $1 billion out of a bond paying 4% in a currency that subsequently lost 30% of its value vis a vis the USD into a US high-yield bond paying 6%, the manager picked up 30% gains in FX and 2% in yield for a total gain of 32%. For a variety of reasons, yields are rising in the US and the USD is gaining value relative to other currencies. Combine higher yields, relatively predictable safety and an appreciating currency, and the US has been attracting global capital. These charts from Credit Suisse reflect this capital flow into the US and out of other nations. 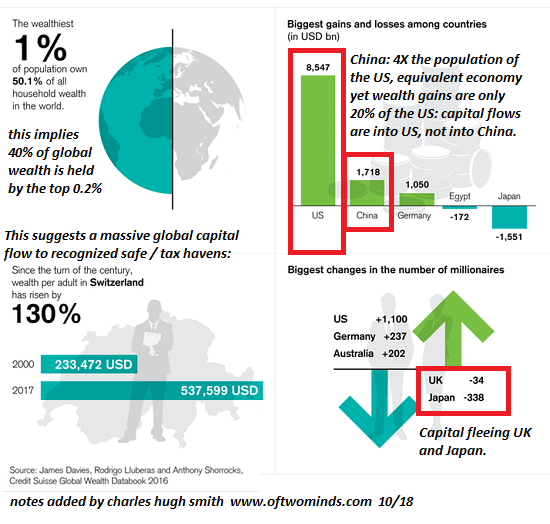 The phenomenal expansion of wealth in China is put into a different perspective here:with 4 times the population of the US and an economy roughly comparable in size, China's wealth has registered only 20% of the gains accrued by the US. If global capital was buying empty flats in China, etc., and selling US-based assets, these numbers would be reversed. This suggests mobile capital is leaving China and other nations and moving into US-denominated assets. Most of the gains in global wealth have accrued to the US and to the top 1%.The wealthier the entity / individual, the greater the rewards and opportunities for moving wealth into tax havens and safe havens such as Switzerland and the US, which is a massive tax haven in its own right. 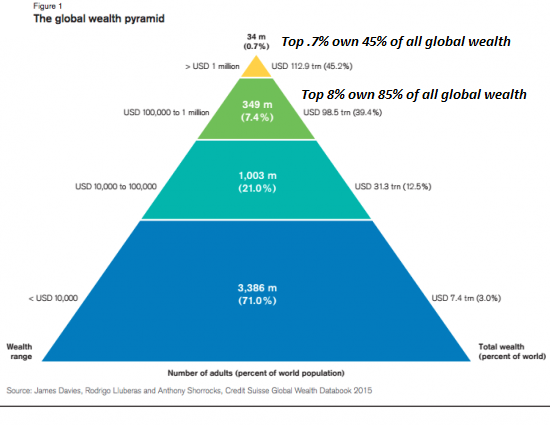 Here's another snapshot of the global wealth pyramid: since the Pareto Distribution applies to wealth and income, we can guesstimate that roughly 40% of all global wealth is held by the top .2% or so. 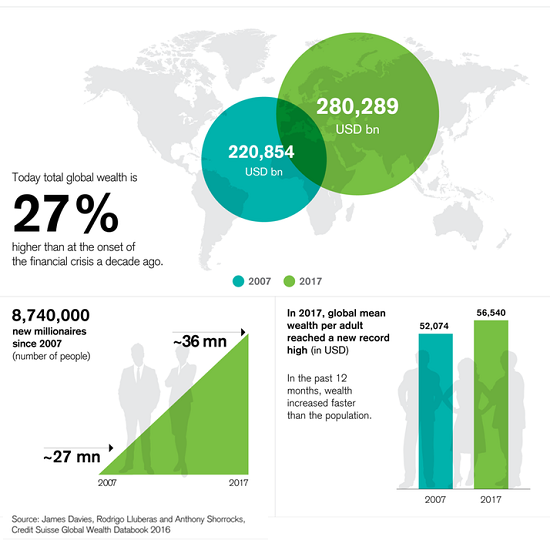 The top 8% (350 million people) own 85% of all global wealth. 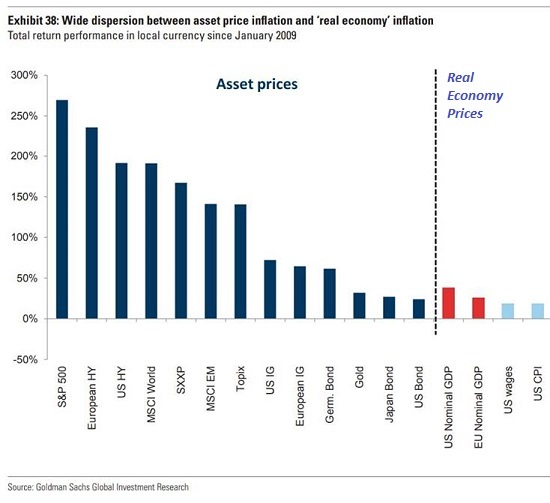 The net result is a gargantuan inflation in assets while real-economy wages and GDP have stagnated. As long as US yields and the USD are ticking higher while the US economy continues expanding opportunities for capital to earn relatively safe yields and capital gains, capital will continue to flow into US assets, despite the nose-bleed valuations of assets such as stocks and left / right coast housing. The key here is the gains generated by owning US-denominated assets as the USD appreciates. A 3% yield in US Treasuries isn't all that great, but add in 10% annual FX gains and you're netting a very healthy 13% annual return in relatively safe and liquid assets. The greater the sums at risk, the more compelling these attributes become. If you need to protect $25 billion, and you want a liquid market you can exit without crashing the bid and exposure to FX capital gains, then USD-denominated bonds and stocks are an attractive option at this juncture. Empty flats in China with zero yield and the potential downside of yuan devaluation--not so much. In summary: follow the money. Smart money is mobile, opaque and constantly on the move seeking safety, tax shelters, yield and capital gains. If mobile capital continues flowing into US assets such that demand exceeds supply, the Bull Market will continue sloshing higher. 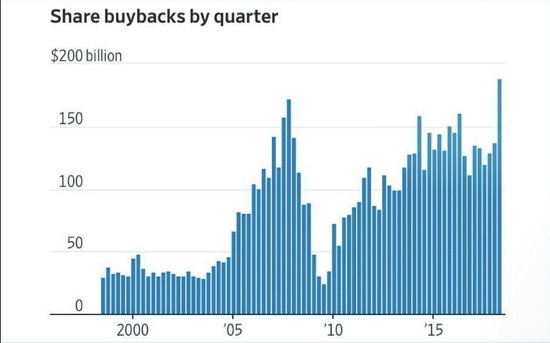 Once supply exceeds demand and capital starts liquidating US assets, the Bull Market will end, perhaps with a whimper (stagnation) or with a bang (crash). Capital flows will dictate the outcome.